10.2-MP DX-format CCD image sensor: A newly developed 10.2 effective megapixel DX-format CCD image sensor captures images with edge-to-edge sharpness and incredible color at 3,872 x 2,592 pixels, yielding extraordinarily high-resolution images perfect for enlargements or creative cropping. Industry-leading image processing for exceptional color performance: Incorporates Nikon's industry-leading advanced image processing engine of the D2x, allowing for color-independent pre-conditioning prior to A/D conversion working in concert with advanced digital image processing algorithms to achieve fine color gradations with exceptionally smooth, consistent transitions. Large viewfinder with 0.94x magnification: The new eye-level optical viewfinder developed for the D200 features large magnification (0.94x) that helps ensure a clear view for precise composition with a built-in diopter adjustment that allows fine-tuning tailored to your eyesight. Durable, magnesium alloy (Mg) body: Nikon's advanced technologies and mechanisms are housed within a rugged, lightweight magnesium alloy chassis, ready for the most rigorous of assignments. Additional dust and moisture sealing add to the D200's strength. 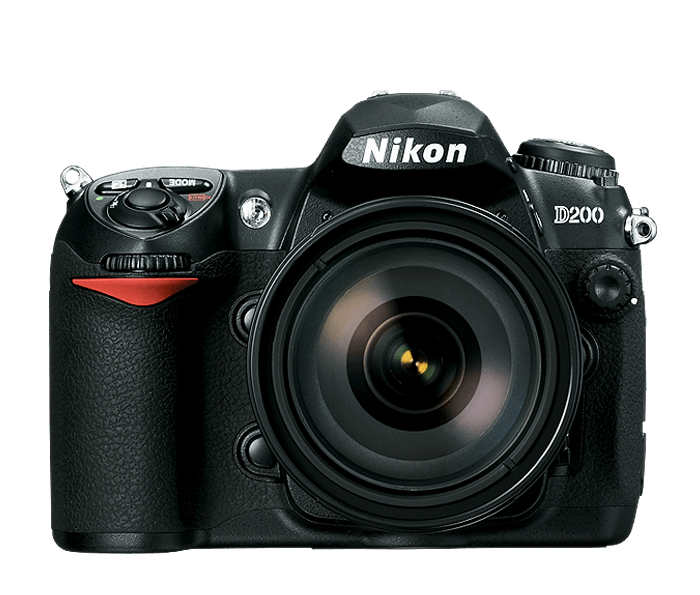 Fast SLR response where it counts: Instant power-up in just 0.15 seconds, a shutter release time lag of a mere 50 milliseconds and a shortened viewfinder blackout time of just 105 milliseconds makes the D200 ready to respond to any photographic situation. 11-area multi-CAM AF system with 7 area wide AF sensor module: The new multi-CAM 1000 AF sensor module offers an 11-area AF that ensures consistently fast and precise focus lock under varying shooting conditions. The 7-wide area AF system offers broad coverage suited for moving subjects enabling greater compositional freedom. Large 2.5-inch LCD monitor with wide-angle viewing to 170 degrees: A high resolution LCD monitor provides ultra-wide, 170-degree viewing in all directions. Assisting with accurate sharpness assessment, images can be previewed at up to 400% magnification. EN-EL3e rechargeable battery with fuel gauge function: The high-energy EN-EL3e rechargeable lithium-ion battery lets you capture up to 1,800 shots per charge featuring an accurate real-time fuel gauge system that displays the percentage of remaining charge, number of shots since last charge and overall status of battery service life. Wireless Transmitter WT-3a: The optional wireless transmitter WT-3a provides wireless functionality with IEEE 802.11b/g technology enabling cable-free image transfer to a compatible computer with the added safety and versatility of wide-ranging network and security protocols. **When using select high performance CompactFlash cards capable of and certified for this performance specification. CompactFlash cards enabling this specification are subject to change. Contact Nikon technical support (800-NIKON-UX) for the latest information. Al NIKKOR: Provide Manual Focus w/ Electronic Rangefinder, Aperture Priority and Manual Exposure Mode, C/W and Spot Metering Operation. AI-P NIKKOR: Provide Manual Focus w/Electronic Rangefinder and Full Metering Operation. All NIKKOR AF-DX, AF-D, AF-G, AF-I, AF-S, and AF VR NIKKOR Lenses Provide Full AF and Full Metering Operation.